Dee's Movie Reviews: The Informant! The Informant! is a strange portrayal of a strange man, and it works. It succeeds as many things: an undercover cop story, an awkward, quirky comedy, and an inside look at the life of a criminal. Based mostly on a true story (the film’s opening “true story” disclaimer had the audience chuckling before the credits even rolled), the events portrayed in The Informant! made national news between 1995 and 2006. However, if you go into this movie, as I did, with no knowledge of the story or its outcome, the plot is delightfully difficult to predict. It won’t pick you up or put you down in any big way; it's just a quiet, peculiar, very good movie. 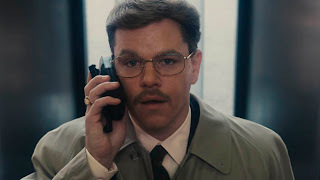 Matt Damon plays Marc Whitacre, a high-ranking executive at ADM, a grain and oil-processing conglomerate. His thoughts guide us along, which are mostly funny, random tidbits that have nothing to do with the action at hand. Under pressure from his wife, Whitacre goes to the FBI and gives information on a global price-fixing scam, becoming the highest-ranking executive to ever be a whistleblower. Now working undercover for the FBI, the odd, scatterbrained Whitacre goes back to work, in over his head and trying desperately to keep his secrets straight. Damon disappears into the role of Mark Whitacre; halfway through the film, I tried to imagine Damon as Jason Bourne, and I just couldn’t wrap my head around those two being the same actor. Whitacre is nervous and awkward: the last person you’d want going into a meeting with a recording device in his briefcase. There’s a good deal of humor surrounding Whitacre, but it’s very muted and realistic. If you knew this guy in real life, you wouldn’t bust out laughing at every turn; you’d probably just chuckle on the inside. That’s how the humor in the movie is, and it helps place you in the story. What makes The Informant! so fascinating is the uncertain identity of the title character. The degree to which Whitacre himself is responsible for the criminal activity he’s reporting is constantly in question, thanks to a fantastic script. As one character says late in the film, “It’s very difficult to tell when Mr. Whitacre is telling the truth.” Another character accuses him of being bi-polar, and in light of his random narrations throughout the picture, it seems very possible. The script puts us on unlikely sides of situations, so that as the story unfolds, we’re as suspicious of being lied to as everyone else. The Informant! reveals information gradually, keeping Mark Whitacre a mystery, right to the end. The Informant! reminded me of Shattered Glass (2003), a largely-overlooked, but very strong, true story about a dishonest journalist. The biggest difference between the two is the ever-present humor. Even in its heaviest moments, The Informant! stays light, thanks to fun music and amusing anecdotes sprinkled throughout. As a director, Steven Soderbergh’s filmography grows more eclectic with each passing year; your odds are good of finding at least one Soderbergh title in every section of your local video store. I usually have strong feelings about his movies, one way or the other, and I’m glad to say that The Informant! is most definitely a winner: a quirky, unique character study, impressive on all fronts. The language in The Informant! isn’t overly heavy or pervasive, but the standard four-letter words do make enough appearances to warrant an R rating. The plot itself would likely confuse/bore younger viewers. Watch the trailer to get a good feel for the humor and pacing.